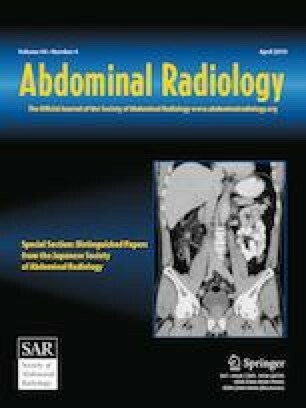 To compare the utility of abdominopelvic fluid volume measurements with established computed tomography signs for refractory post-traumatic abdominal compartment syndrome. This retrospective observational cohort study included 64 consecutive adult trauma patients with preoperative CT and diagnosis of refractory abdominal compartment syndrome requiring decompressive laparotomy at a level I trauma referral center between 2004 and 2014. We hypothesized that abdominal fluid volume measurements would be more predictive of the need for early laparotomy than previously described conventional CT signs of refractory ACS. Abdominopelvic fluid volumes were determined quantitatively using semi-automated segmentation software. The following conventional imaging parameters were recorded: abdominal anteroposterior:transverse ratio (round belly sign); infrahepatic vena cava diameter; distal abdominal aortic diameter; largest single small bowel wall diameter; hydronephrosis, inguinal herniation; and mesenteric and body wall edema. For outcome analysis, patients were stratified into two groups: those who underwent early (< 24 h) and late (≥ 24 h) decompressive laparotomy following CT. Correlation analysis, comparison of means, and multivariate logistic regression were performed. Abdominal fluid volumes (p = 0.001) and anteroposterior:transverse ratio (p = 0.009) were increased and inferior vena cava diameter (p = 0.009) was decreased in the early decompressive laparotomy group. Multivariate analysis including conventional CT variables, fluid volumes, and laboratory values revealed abdominal fluid volumes (p = 0.012; Δ in log odds of 1.002/mL) as the only independent predictor of early decompressive laparotomy. Segmented abdominopelvic free fluid volumes had greater predictive utility for decision to perform early decompressive laparotomy than previously described ACS-related CT signs in trauma patients who developed refractory abdominal compartment syndrome. This work was presented at the 2017 RSNA meeting (Abstract RC 208-09, 11/27/17) and the 2017 SCBTMR meeting. Thomas W.K. Battey was supported by Radiological Society of North America (RSNA) Medical Student Research Grant #RMS1603. David Dreizin is supported by an RSNA Research Scholar Grant #RSCH1605. This funder had no role in the study design, collection, analysis and interpretation of data, the writing of the manuscript, or the decision to submit the manuscript for publication. IRB Approval: This study was approved by the University of Maryland Medical Center Institutional Review Board.